It all started with the perfect baby bib. After 14 years in the healthcare profession as a registered nurse and certified nurse midwife, Jamie decided to become a stay at home mom after the birth of her daughter in 2011. She always knew she had a creative side since she was a kid, learning how to sew from her grandmother and making her own clothes. It wasn’t until her baby girl started eating puree baby food and making a mess everywhere that Jamie had an idea of the perfect bib that could make the mess more manageable. 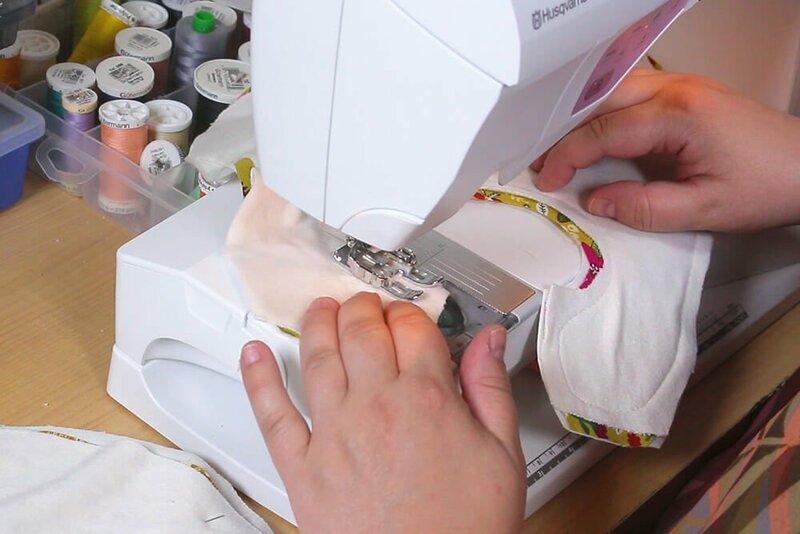 Jamie went to work at her sewing machine to produce baby bibs that would not only help her, but other parents with messy babies. Jamie named her business Bourgeois Baby and soon started branching out and making other baby products like burp cloths and swaddle blankets. 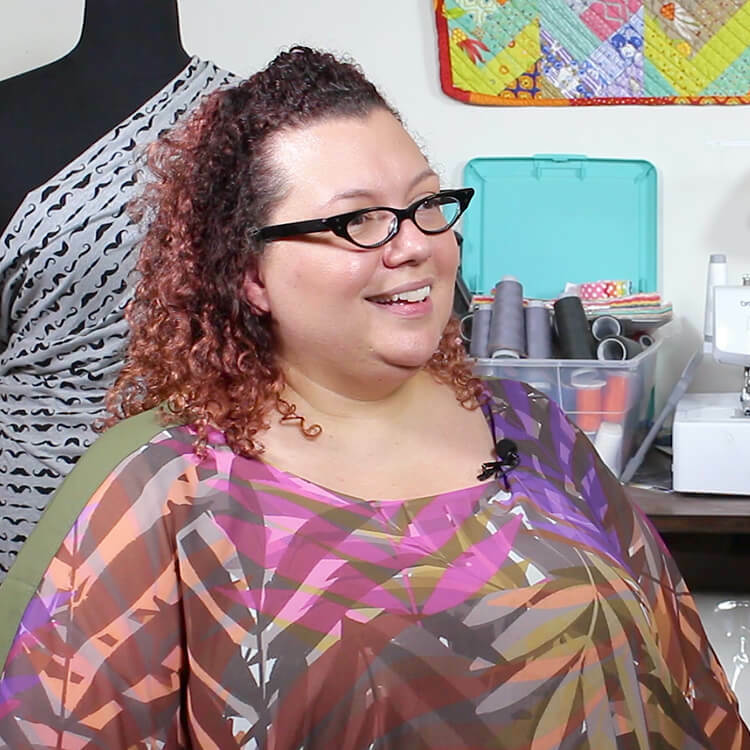 We had the chance to sit down and talk to Jamie about her business and creative process. JB: Bourgeois Baby customers are typically moms and grandparents who want a unique, quality product that will last well beyond a retail product. Our customers tend to look at quality over quantity and value handcraft. Did you ever have moments of doubt about your business? If so, what made you continue on with it? JB: There is no specific moment that I thought I needed to pack up shop, but I do sometimes question where in the world am I going to find the time to grow the business to the levels I want it to be. My primary “role” in life is being a stay at home mom to my daughter. While this is a great job to have, I do look forward to her being in school all day. She’s currently in Kindergarten so right now it’s just 3 hour school days. I have had doubts from friends and family when I announced I was making Bourgeois Baby a business. One friend even said, “Oh, that’s a nice way of occupying your time til you go back to your real job.” I initially tried to explain that was not the plan and that Bourgeois Baby was the real job. Four years later most of the them finally get it. Do you have an assistant? If so, can you explain how working together helps the business? JB: My husband helps with some of the making of the bibs. He’s been nicknamed the Snap Master as he is in charge of applying all of the snaps to our bibs with the industrial press, as well as keep track of the snap related inventory. He has also started fabric cutting for me when things get busy like holiday shopping season. We don’t work well together at all. Our styles of work management are so different, and my patience is fairly thin in general. It just never ends well if we have to work side by side. Probably the only reason he’s been able to remain the Snap Master is he works in his own space, I work in mine! When did you realize that your business has a market and has potential to be successful? JB: I knew that our bibs had a market as soon as friends wanted them. What do you like to do for fun in your spare time outside of work? JB: Time is always an issue but I enjoy a lot of things in life. I enjoy swimming, reading, knitting, writing, hanging with my friends and family. Have you ever participated in craft fairs or any events to help promote your business? JB: Bourgeois Baby has participated in quite a few expos and craft fairs. We have learned a lot through doing shows on how to better market ourselves and get a better understanding of our customer niche. This year we have narrowed down our live events to just two. We were at the New Hampshire Mama & Baby Expo in May, and will be at the Boston Christmas Festival for the 3rd year. We have also had the opportunity to showcase our products at the Big E fair this year, and in the New Hampshire General Store, and were excited to introduce our bibs to Western MA. Where do you currently sell you’re products? Would you like to expand? JB: We sell our baby bibs at a variety of places. We sell via our own retail website, but currently the majority of our business is wholesale. We sell through the New England area at Whole Foods Markets and some small independent brick and mortars in New Hampshire, Maine, and Massachusetts. Writers sometimes get writers block. Do you ever get the “design” block or feel at times your creativity is on vacation and can’t think of new ideas? If so, how do you push through that? JB: When Bourgeois Baby started, I tried way too hard to diversify the product line. I was doing all sorts of things that got lots of positive comments but not a lot of sales. I kept trying hard to figure out what clothing design I could come up with that would “work”. I gave it a break and initially thought I would never be able to come up with an adequate brand. However, one day I suddenly realized I was selling bibs really well and that was the exact reason Bourgeois Baby was started. I let go of trying to come up with other items and have since focused on bibs. How does it make you feel when you see a baby wearing one of your products? JB: I think the saying is “it gives me all the feels”. Seriously, I love it! Do you get involved in any charities or organizations that help others and help promote your business? JB: We have done some small scale donations to the local YMCA and VFW. I am also a big NPR fan so we became an underwriter for New Hampshire Public Radio last summer. My goal, once we are making a large enough revenue, is to somehow work with the March of Dimes. My daughter, the inspiration behind Bourgeois Baby, was born prematurely and their mission of ending premature birth is obviously close to our hearts. Can you talk a little about your studio and how you made it your own creative space? JB: My studio space is just a bedroom converted into an office and creative space. Initially the studio was just a spare room in our house that we put a computer in. Eventually my sewing machine was set up in there, and before I knew it fabric and supplies are just everywhere. It’s messy. My organizational skills don’t seem to enter the studio at all as much as I wish they would. Lastly, how important is it for you to use organic fabric that is stripped from chemicals that other fabrics consist of? JB: Organic fabric needs to be more of a thing. 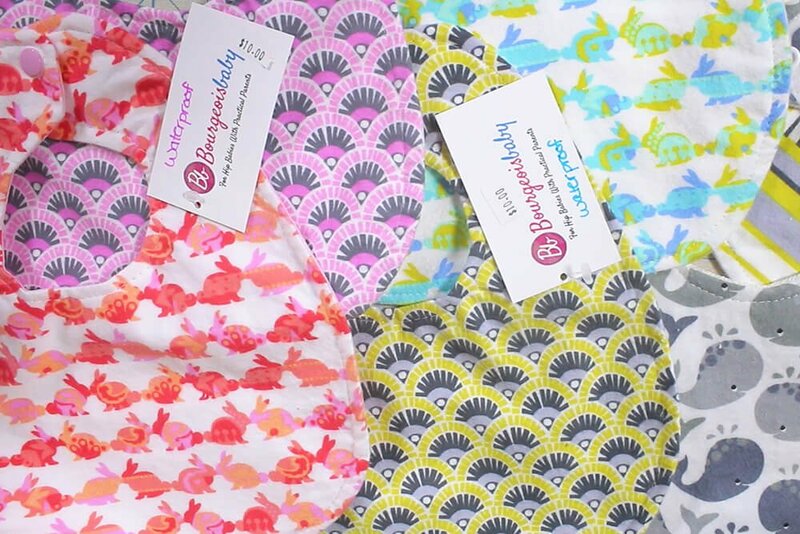 Bourgeois Baby has an organic line of bibs but unfortunately the options of organic fabrics is not where it needs to be. 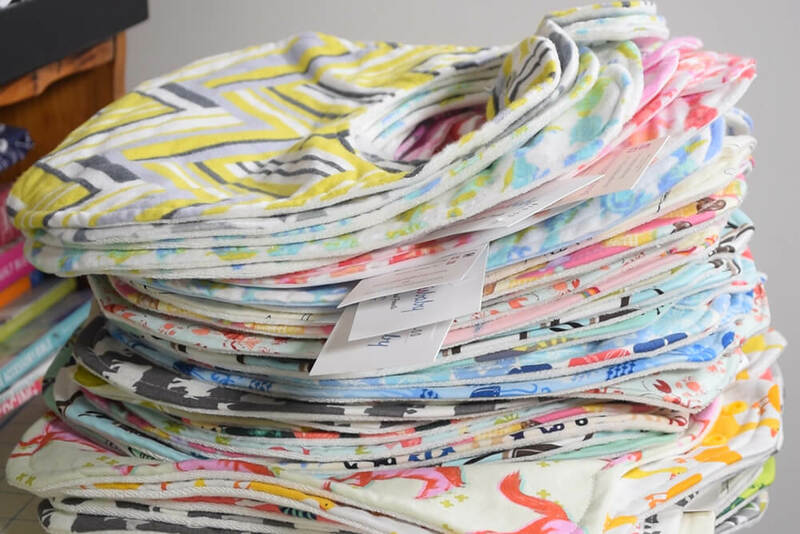 We have managed to find an awesome organic cotton/bamboo blend terry cloth that we use on all of our bibs, but we certainly wish there was more cotton prints available in organic versions. Organic fabrics is often used for baby items and for good reason. Cotton is one of the most widely grown crops in the world. It is one of the most heavily chemically treated crops, too. These chemicals have many detrimental impacts from the environment, to the people who harvest and process cotton, all the way to the final consumer. Babies bodies are particularly susceptible to these chemicals given their small body size and immature immune and organ systems. Organic cottons in particular are a great way to make an environmental and health impact. Every part of the fabric manufacturing is taken into account in regards to keeping the integrity of the organically grown cotton.